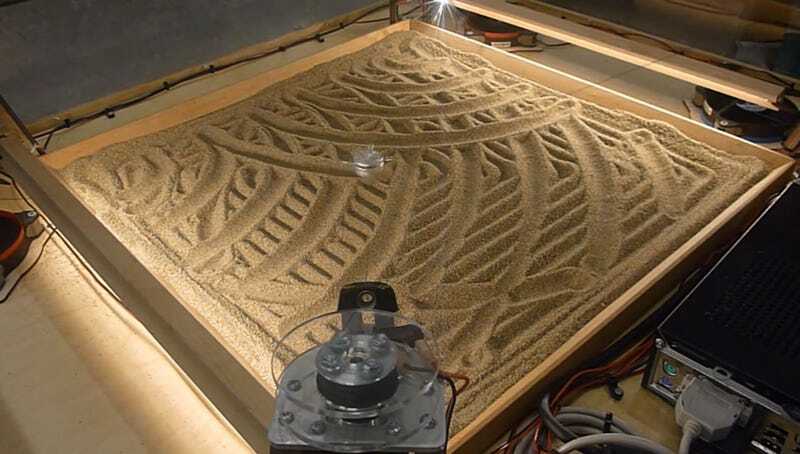 There are challenges to making art in any medium, and with sand the issue is clearly accuracy. How do you keep everything in place while you're working? David Bynoe, a kinetic sculptor in Calgary, Alberta, created this drawing machine for the Telus Spark Science Centre to solve that problem. Bynoe attached four strings to a weight and then connected each string to a pulley and stepper motor at the four corners of a box so the weight could be controlled by tightening and slackening the ropes. When the box is filled with sand, the weight can draw precisely on the sand in a 590 x 590 x 220mm area.